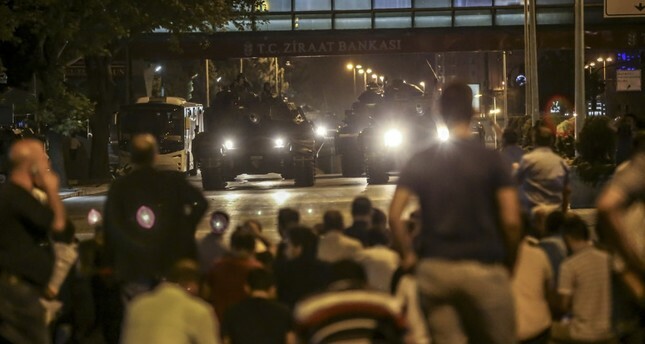 People stage a sit-in to confront the tanks controlled by putschists in Ankara, July 15, 2016. Military officers based in Diyarbakır were accused of dispatching warplanes to Ankara to help putschists. As defendants in trials for the July 15, 2016 coup attempt keep denying their links to the Gülenist Terror Group (FETÖ), a recent court ruling disclosed intimate ties between putschists and "civilian" members of FETÖ. The terrorist group employed its military infiltrators for the brutal takeover attempt that killed 251 people, according to prosecutors, but military officers on trial often deny their links to the group. In a case in the southeastern city of Diyarbakır, two generals and a colonel were found to have made repeated phone calls before the coup attempt to significant figures in FETÖ. Generals Atilla Darendeli and Deniz Kartepe and Col. Bülent Gürdoğan were stationed in a major airbase in the southeast during the coup attempt and organized the dispatch of six F-16 warplanes from Diyarbakır to Ankara; warplanes involved in airstrikes targeting Parliament, the headquarters of the Special Operations unit of the Turkish National Police and the headquarters of the intelligence agency. Three men were sentenced to aggravated life imprisonment in February. A detailed ruling in the case disclosed this week shows a list of contacts they made with "secret imams" of FETÖ, a name given to the terrorist group's handlers for its infiltrators in the military. These handlers are usually nonmilitary people who regularly contact infiltrators to instruct them how to act in a certain situation, to have information about developments in their military unit and for surveillance of military officers not linked to the group. Darendeli was in contact with Cafer Sarıkaya through the latter's cellphone number, which was registered to someone else, before the coup attempt. Sarıkaya was one of the handlers for the terrorist group's infiltrators in Akıncı airbase in Ankara, which served as the command center of the coup attempt. Top military brass, including Chief of Staff Hulusi Akar, were held captive there by putschists for their opposition to the attempt, while fighter jets taking off from the base joined other warplanes commanded by putschists for airstrikes across the capital on July 15, 2016. Sarıkaya is believed to have fled to Canada. His other contacts, who used cellphones registered to someone else to avoid being detected, were Birol Kurubaş and Harun Biniş. Kurubaş was captured in Istanbul months after the coup attempt, while Harun Biniş was among the "civilians" captured while escaping Akıncı base hours after the putsch bid was thwarted. Kurubaş and Biniş were among the FETÖ handlers who attended meetings in an Ankara villa between FETÖ figures and the group's military infiltrators to plan the attempt shortly before the event. Adil Öksüz, a senior FETÖ figure, had organized the meetings according to prosecutors. Öksüz, like Biniş, was captured in Akıncı after the coup attempt but remains at large after judges allegedly linked to the terrorist group let him go in a controversial ruling. Öksüz is accused of masterminding the coup attempt on behalf of the group's U.S.-based leader Fetullah Gülen. Harun Biniş, currently in custody and on trial, had denied his involvement in the coup attempt, though he failed to explain footage in which he is seen walking casually around on the command floor of the military base with putschist officers. Deniz Kartepe had multiple phone calls with Ahmet Numan Akpınar, according to the court ruling. Akpınar was the FETÖ handler for the group's infiltrators in Çiğli airbase in western Turkey. The base was where teams of assassins sent by putschists converged before flying to the southwestern town of Marmaris with the intention of assassinating President Recep Tayyip Erdoğan who was vacationing there at the time of the coup attempt. The court ruling says Bülent Gürdoğan has been a part of FETÖ since his school years and stayed in "houses of light," informal dormitories run by FETÖ to accommodate young recruits. His father was among businesspeople contributing to the terrorist group's funding, while his sister has worked in companies linked to the terrorist group.